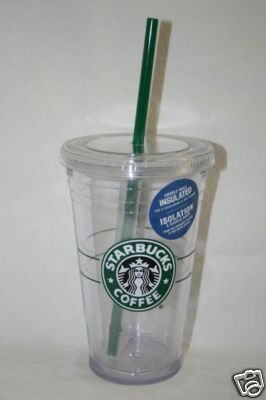 This Summer, there was a 16 ounce tumbler available at Starbucks that looked like a to-go cup, but it was reusable. This cup was pretty neat looking, but rather over priced at the time. I wanted one, but didn’t feel like shelling out $15 for a plastic cup with a logo on it. Well, I thought about it the other day, and thought I wanted one again, and maybe Starbucks would be selling old stock at a discount as they tend to do. Much to my surprise, this was not the case at all. In fact, the cup was so popular that it sold out almost immediately, and has been an EXTREMELY hot item on ebay every since. Check this link. I wonder why Starbucks doesn’t just re-release this cup. There is CLEARLY demand for it. They should try to make a buck. I might even buy one this time. This entry was posted in food and tagged coffee, cup, drink, ebay, forsale, Starbucks on October 2, 2008 by Adam Noah.